Queer Women of Color Media Arts Project (QWOCMAP) executive director Madeleine Lim has organized a group that promotes the creation, presentation, and distribution of queer women of color movies. Increased visibility, real life stories, community bonding, and developing film technique are a few of the goals. Training and the use of equipment, screening opportunities, and finding resources brings together women from all over the community. Public events include festivals, screenings, and discussions across the country. The San Francisco panel discussion on January 13, 2009, “Reels of Resistance: Queer Women of Color Filmmakers,” drew an appreciative audience to a dynamic presentation of what is happening in the world of queer women's cinema. Executive director Madeleine Lim brought together a producer and three filmmakers to the San Francisco Main Library for an eloquent dialogue, Q&A’s, and provocative film clips. The issues brought forth in the clips and the high quality of the filming drew questions about when the entire films could be seen. Liliana Hueso has worked as a producer at Telemundo, in a TV industry that is heavily male. Her next project is to bring the Queer Women of Color training South of the Border for advancing women’s film creativity in Mexico. Jennifer Lin’s shocking film “Look Again” about immigration featured an Asian and a white lesbian couple, with aggressive ICE agents and a surprise ending. The white lesbian was the non-citizen who had to leave the U.S..
Rachel Poulain spoke about how she is perceived and how she has asserted herself to have a successful film career. She is the director of outreach for California Newsreel, a documentary production and distribution center. Rachel is bringing together students to produce social justice documentaries. Yun Ing Suh was able to make an important and eagerly anticipated film about Israel and Palestine conflicts ”City of Borders” because she was mistaken for an amateur, so she freely passed through barriers and freely filmed in forbidden areas. People opened up to her and she was able to get astounding interviews. The panelists spoke about future projects that include people of mixed race backgrounds and women in India being hired as surrogate mothers. A goal of the group is for women of color to making a living in cinema. And one filmmaker said that QWOCMAP classes were so thorough that she saved thousands of dollars and did not have to go to film school. 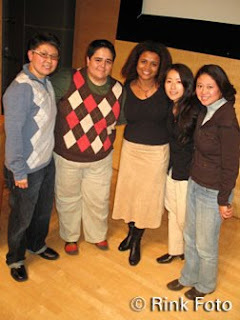 From its first presentation the Queer Women of Color Film Festival has been a huge success, and the 5th festival is happening in San Francisco June 12-14, 2009.